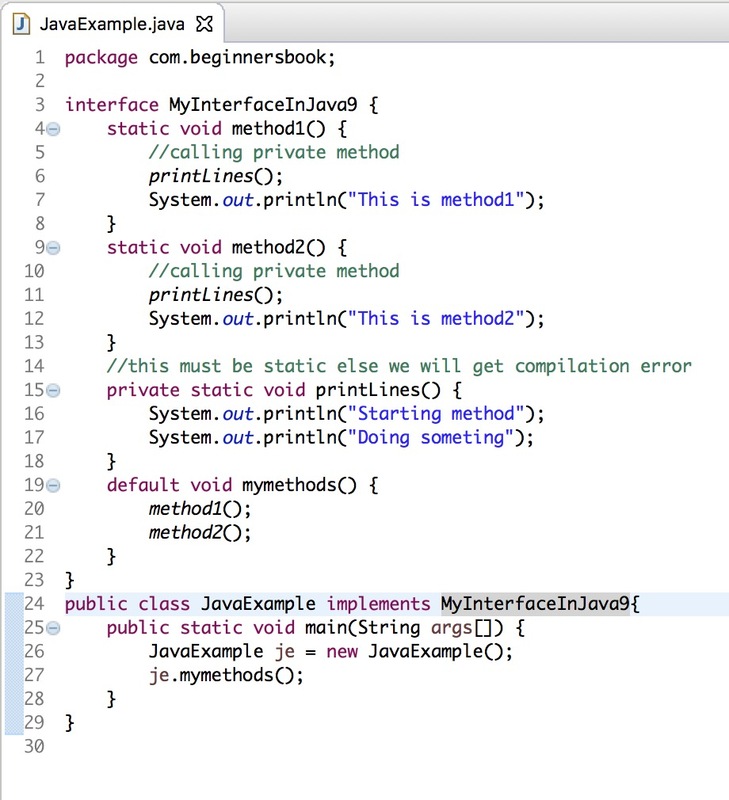 As we know that Java 8 allowed us to create default and static methods in Interface. The intention was to have new methods added to the interfaces without breaking the classes that already implemented those interfaces. Java 9 has introduced another new feature, Java 9 SE onwards we can have private methods in interfaces. In this guide, we will learn why they added this feature, what is the use of it and how to work with it. Why Java 9 allows us to have private methods in Interfaces? Java 9 introduced private methods in interfaces to remove the redundancy by sharing the common code of multiple default methods through private methods. To understand this we have to take an example in Java 8 (without private methods) and then we will take the same example with Java 9(using private methods). In this example we will see how default methods can have duplicate code which unnecessary increase the lines of code and makes the code less-readable. We will take the same example again using private methods to see how can private methods help us to avoid duplicate code. We are taking the same example that we have seen above. This time we will introduce a private method to share the common code. As you can see the output is same and the code size has been reduced. 2. Improves readability of code. Till now we have leaned how to use private methods in interfaces to share common code of default methods. Java 9 also allows us to have private static methods in interfaces. Since java 8 we can have static methods in interfaces along with default methods. We can not share the common code of static methods using the non-static private method, we must have to use the private static method to do that. Lets take an example to understand this. Here is the screenshot of Eclipse Oxygen.